We are really excited for this upcoming weekend, tomorrow is going to be a HUGE HUGE night over in upstate NY! We have the rising Swedish duo under At Night Management (Avicii’s label), Cazzette, performing at Syracuse University at the Goldstein Auditorium, which is located right near frat row, so uhh can you say FRAT after party confirmed by the artists themselves? I can. 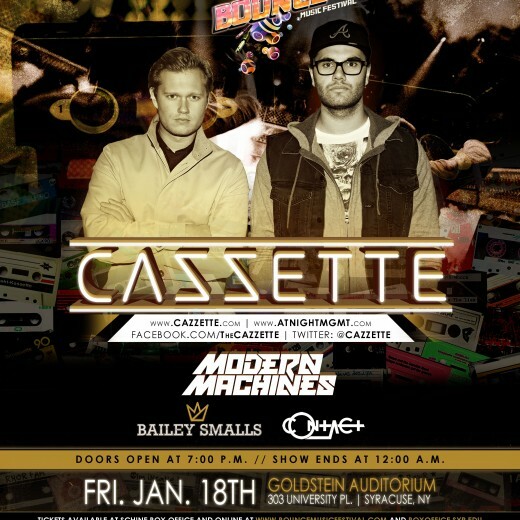 Cazzette – Bounce Music Festival – Syracuse – Announcement Video from SyracuseUniversityEDM on Vimeo. As a special treat to all of you who follow us here at The Drop Media and who live in the NY area, we are giving away 3 free tickets to the show for tomorrow night! The only thing you have to do is “like/follower” our Facebook/Twitter pages, and share the event on your page. Get to it and we will announce the winners tomorrow at 3PM. Get hyped for a rowdy night and grab your tickets at Syracuse Campus or through Bounce Music Festival’s website.